Low carb smoothie recipes are an easy but delicious option for breakfast and snacks when you are on a low carb diet. With a few simple ingredients and a blender, you can create many different smoothie flavors. By definition, a smoothie is a "creamy beverage made of fruit blended with juice, milk or yogurt." For low carb options, first let's examine which fruits qualify as low carb. Take note, however, that if you are on Phase One of the Atkins Diet or the South Beach Diet, you are advised to avoid fruits, but low carb fruits are perfectly acceptable for later phases. Check the guidelines for your specific low carb diet. Along with fruit, as mentioned above, smoothies often include juice, milk or yogurt. Once you have selected a combination of low carb fruits, you must find low carb options for the other ingredients as well. Juices are typically high in sugar and carbs. Orange juice is the most common juice mixer in smoothies, and an easy low carb substitute is Orange Crystal Light. There are also diet versions made by popular orange juice manufacturers that are low in carbs. Milk contains lactose, which is milk sugar, so it is usually not approved for low carb diets. However, there are low carb milk options that replace the lactose with Splenda or another artificial sweetener. Soy milk is much lower than cow milk in carbs, making it a good option for use in smoothies. Yogurt creates a rich texture in smoothies, but it can sometimes be high in carbs. Plain yogurt is the lowest in carbs, but if you must have a flavor such as vanilla, avoid products containing milk powder (lactose) and added sugar. Many yogurt manufacturers offer low carb options that contain artificial sweeteners. 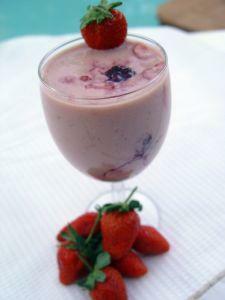 Greek yogurt is also a fairly low carb option that adds tang and more texture to smoothies. The most basic low carb recipe involves mixing a few pieces of fruit with milk and yogurt and then blending with a few ice cubes, but there are many variations. Once you have mastered the basics of making a smoothie the low carb way, you can invent your own concoctions to satisfy your cravings for sweets without ruining your diet.